In 1949 the German constitution set down the entitlement to equality for men and women in the Federal Republic of Germany in article 3. Until the late 1950s it was up to men to decide where to live and how to utilise families’ assets. Women were not permitted to decide on their participation in the labour market but had the duty to administer the household and help their husbands. When Angela Merkel became chancellor of Germany in 2005, she was not only one of the most influential politicians in the world but also one of the few female leaders who managed to break through the glass ceiling. Chancellor Merkel herself blocked Minister of Employment, Ursula von der Leyen’s attempt towards affirmative action. As a matter of fact Germany is lagging behind when it comes to women in leading positions. In 2010, only 0,9% of the leadership positions in the 100 largest German companies and 2,6% in the top 200 companies were held by women. (Holst & Wiemer, 2010) This is in stark contrast to the fact that at team-leader level in German companies, women represent 20% of the staff after representing almost 60% of university graduates. This underrepresentation, which illustrates the topic of this study, is especially difficult to understand since recent studies have shown a positive correlation between the proportion of women in management positions and companies’ performance, which made approximately 10% more in terms of profits with a balanced gender policy (Wiemer, 2010). 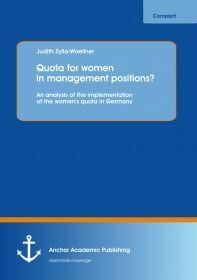 As a consequence, Germany is facing a discussion on the introduction of a women’s quota for management positions in German companies. Currently there is a great debate going on concerning the pros and cons of a women’s quota. Ähnliche Artikel "Marketing & PR"
Ähnliche Artikel "Managementtechniken & Konzepte"